Porter, T.M. (ed. 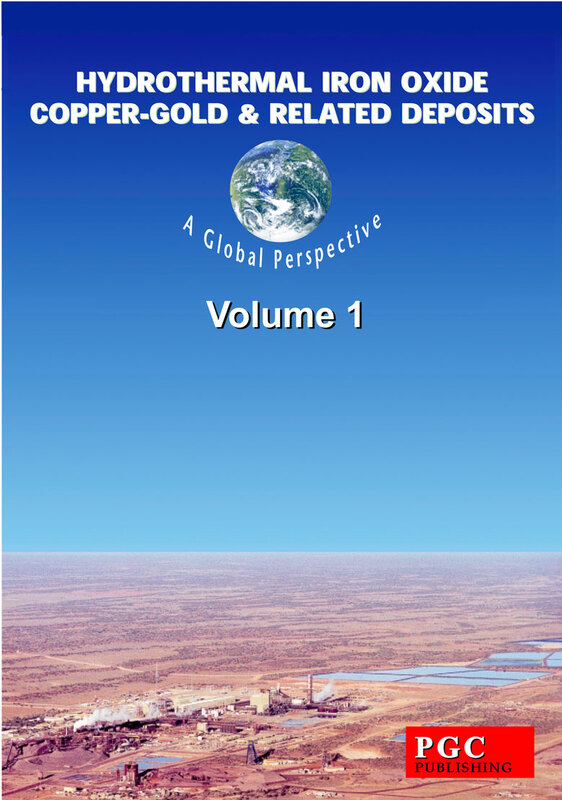 ), 2000 - Hydrothermal Iron Oxide Copper-Gold and Related Deposits: A Global Perspective, vol. 1, PGC Publishing, Adelaide, 350p. ISBN 978-0-9580574-0-0. This is part of a four volume set, which collectively, represent the only comprehensive texts available on the important Iron Oxide Copper-Gold (IOCG) family of deposits. Published in November 2000, this 350 page book has 24 papers, including overviews from leading experts & descriptive papers on the classic districts/deposits. Released in May 2002, this 380 page book contains 20 all new papers, expanding on the global coverage achieved by volume 1. This 26 paper, 600 page, two volume set, with more than 100 colour images, details advances in the understanding of IOCG deposits, complementing volumes 1 & 2. This volume, was developed and edited by T M (Mike) Porter of Porter GeoConsultancy Pty Ltd (PGC). Edition 1 was published through the Australian Mineral Foundation Inc. (AMF) in 2000; Edition 2 was published by PGC Publishing in 2002 after being unconditionally assigned the copyright by AMF. An upgraded Edition 3 was released in Sep. 2011. Iron Oxide-Cu-Au Deposits: What, Where, When, and Why? Douglas W Haynes, Chief Geologist, BHP Minerals Discovery, Australia. Iron Oxide Copper (-Gold) Deposits: Their Position in the Ore Deposit Spectrum and Modes of Origin. Patrick J. Williams, James Cook University, Townsville, Australia & Roger G. Skirrow, Australian Geol. Surv. Organisation, Canberra. Graham S Teale, Teale and Associates Pty Ltd, Australia, C Mark Fanning Australian National University. The Portia - North Portia Cu-Au(-Mo) Prospect, South Australia; Timing of Mineralisation, Albitisation and Origin of Ore Fluid. Robert Marschik, Lehrstuhl für Lagerstättenlehre, Institut für Mineralogie, Germany (currently Department of Geosciences, University of Arizona, Tucson, U.S.A); Richard A. Leveille, Phelps Dodge do Brasil Mineraçäo S.A., Brazil; Walter Martin, Compañía Contractual Minera Candelaria, Chile. La Candelaria and the Punta del Cobre District: Early Cretaceous Iron-Oxide Cu-Au(-Zn-Ag) Mineralization. David Hopper & Arturo Correa, Rio Tinto Mining and Exploration Limited, Chile. The Panulcillo and Teresa de Colmo Copper Deposits; Two Contrasting Examples of Fe-Ox Cu-Au Mineralisation from the Coastal Cordillera of Chile. Petronilia C. Ronze, Anselmo D. V. Soares, Marcos Giovanni S. dos Santos, Célio F. Barreira, Rio Doce Geologia e Mineração SA, DOCEGEO, Brazil. Edison Tazava & Claudinei Gouveia de Oliveira, Universidade de Brasilia, Brazil. Karin Requia & Luis Fontbote, University de Geneva, Geneva, Switzerland. The Salobo Iron-Oxide Copper-Gold Deposit, Carajas, Northern Brazil. Cheryl M. Seeger, Missouri Department of Natural Resources, Division of Geology and Land Survey, USA. Christopher J. Carlon, Anglo American Plc. Iron Oxide Systems and Base Metal Mineralisation in Northern Sweden. Martin Smith, The Natural History Museum, U.K, and Wu Chengyu, Rio Tinto Mining and Exploration, China. The Geology and Genesis of the Bayan Obo Fe-Ree-Nb Deposit: A Review. Bruce Nisbet, John Cooke, Michael Richards and Craig Williams, Equinox Resources Limited, Australia. Exploration for Iron Oxide Copper Gold Deposits in Zambia and Sweden; Comparison with the Australian Experience. Petrus J. Fourie, Vergenoeg Mining Company (Pty) Ltd, South Africa. The Vergenoeg Fayalite Iron-Oxide Fluorite Deposit, South Africa: Some New Aspects. Robin E Harmer, Economic Geology Unit, Council For Geoscience, South Africa.
. Mineralisation of the Phalaborwa Complex and the carbonatite connection In Iron Oxide-Cu-Au-U-REE deposits. Noreen M. Vielreicher, David I. Groves and Richard M. Vielreicher, The University of Western Australia. The Phalabowra (Palabora) Deposit and Its Potential Connection to Iron-Oxide Copper-Gold Deposits of Olympic Dam Type. This volume and its contents were developed, organised and edited by T M (Mike) Porter of Porter GeoConsultancy Pty Ltd (PGC). The first edition was published by the Australian Mineral Foundation (AMF) in 2000. Subsequent to the liquidation of the AMF, copyright in this volume was unconditionally assigned to PGC Publishing, who has printed and is marketing a second edition for sale globally via the world wide web through the PGC Publishing electronic bookshop. An upgraded Edition 3 was released in Sep. 2011. ABN 15 075 541 632.